With this revelatory and painstakingly researched book, Martha Washington, the invisible woman of American history, at last gets the biography she deserves. In place of the domestic frump of popular imagination, Patricia Brady resurrects the wealthy, attractive, and vivacious young widow who captivated the youthful George Washington. Here are the able landowner, the indomitable patriot (who faithfully joined her husband each winter at Valley Forge), and the shrewd diplomat and emotional mainstay. 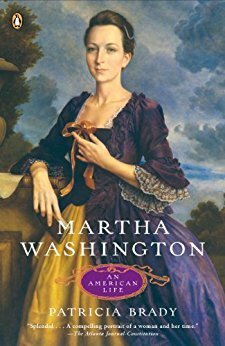 And even as it brings Martha Washington into sharper and more accurate focus, this sterling life sheds light on her marriage, her society, and the precedents she established for future First Ladies. I picked up this book used and decided to finally read it a few weeks ago. When I first started reading it, I didn’t know much about it, and I thought it was a novel, but it isn’t. This book is a book biography about Martha Washington. I will admit that I knew very little about Martha Washington except the basic stuff from history books or from reading about George Washington. I really loved this book because it gave facts about Martha Washington that I didn’t know. I also realized that George Washington was who he was and did what he did because of Martha. She is a huge part of American history and probably doesn’t get the credit that she deserves. This book was well written and easy to read. At times it read way more like a novel than a biography. I look forward to reading other books by this author!